living at P.O. Oxford, Norway, Oxford County, Maine. 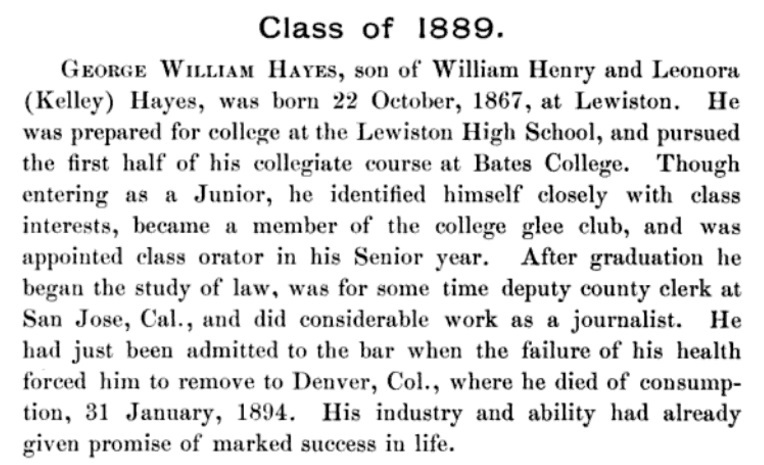 "Maine, Births and Christenings, 1739-1900," index, FamilySearch (https://familysearch.org/pal:/MM9.1.1/FW1S-JQ2 : accessed 28 Oct 2012), Bethany Hayes in entry for George Lewis Hayes, 22 Sep 1831; citing reference 35, FHL microfilm 11588. "Maine, Births and Christenings, 1739-1900," index, FamilySearch (https://familysearch.org/pal:/MM9.1.1/FW1S-JQX : accessed 28 Oct 2012), Bethany Hayes in entry for Luther Porter Or Luthera Porter Hayes, 22 Apr 1831; citing reference 35, FHL microfilm 11588. 1850 United States. Census Office. 7th census, Population schedules of the seventh census of the United States, 1850, Washington, District of Columbia: National Archives. Central Plains Region, (1964) , Census Place: Norway, Oxford, Maine; Roll M432_263; Page: 62; Image: 121. "Maine, Births and Christenings, 1739-1900," index, FamilySearch (https://familysearch.org/pal:/MM9.1.1/FW1S-JQJ : accessed 28 Oct 2012), Bethany Hayes in entry for William Franklin Hayes, 17 Jan 1831; citing reference 35, FHL microfilm 11588. 1870 United States. Census Office. 9th census, Population schedules of the ninth census of the United States, 1870, Washington, District of Columbia: The National Archives, (1962, 1968) , Census Place: Norway, Oxford, Maine; Roll M593_551; Page: 264; Image: 47. "Massachusetts, Births, 1841-1915," index and images, FamilySearch (https://familysearch.org/pal:/MM9.1.1/FXCT-DBX : accessed 28 Nov 2012), Anna Mary Haynes, 1861. 1880 United States. Census Office. 10th census, 1880 federal population census, Washington, District of Columbia: National Archives and Records Service, ([19--]) , Census Place: Natick, Middlesex, Massachusetts; Roll 541; Family History Film: 1254541; Page: 238D; Enumeration District: 410; Image: 0555. 1910 United States. Bureau of the Census. 13th census, 1910 population census schedules, Washington, District of Columbia: Bureau of Census Micro-Film Lab, ([19--?]) , Census Place: Natick, Middlesex, Massachusetts; Roll T624_602; Page: 15B; Enumeration District: 950; Image: 1372. 1920 United States. Bureau of the Census. 14th census, 1920 population census schedules, Washington, District of Columbia: The National Archives, ([193-?]) , Census Place: Natick, Middlesex, Massachusetts; Roll T625_716; Page: 13A; Enumeration District: 352; Image: 191. She was the daughter of Willard Otis Haynes and Nancy Marsh Thurston. "Massachusetts, Births, 1841-1915," index and images, FamilySearch (https://familysearch.org/pal:/MM9.1.1/FXCJ-7RZ : accessed 24 Nov 2012), Eliza B Haynes, 1856. "Massachusetts Deaths, 1841-1915," database with images, FamilySearch (https://familysearch.org/ark:/61903/1:1:NWN7-L68 : 10 December 2014), Jennie Gertrude Forbes, 04 Feb 1905; citing So. Framingham, Massachusetts, v 44 cn 89, State Archives, Boston; FHL microfilm 2,070,772. "Massachusetts, Deaths, 1841-1915," index and images, FamilySearch (https://familysearch.org/pal:/MM9.1.1/N7K7-SLR : accessed 24 Nov 2012), Ella Maria Haynes, 1852. "Massachusetts, Births, 1841-1915," index and images, FamilySearch (https://familysearch.org/pal:/MM9.1.1/FXDR-9ZR : accessed 24 Nov 2012), Franklin W Haynes, 1854. Brown Thurston, , p.220, #4510. 1900 United States. Census Office. 12th census, 1900 population census schedules, Washington, District of Columbia: Bureau of the Census Micro-Film Laboratory, ([197-]) , Census Place: Natick, Middlesex, Massachusetts; Roll T623_663; Page: 7A; Enumeration District: 886. 1930 United States. Bureau of the Census. 15th census, United States, 1930 federal census : population schedules ; NARA microfilm publication T626, Washington, District of Columbia: Bureau of the Census Micro-Film Laboratory, ([19--?]) , Census Place: Natick, Middlesex, Massachusetts; Roll 925; Page: 9B; Enumeration District: 357; Image: 501.0.
living at Fiske Street, Natick, Massachusetts. Massachusetts, Births, 1841-1915," index and images, FamilySearch (https://familysearch.org/pal:/MM9.1.1/FXCJ-XSF : accessed 28 Nov 2012), Haynes, 1857. Massachusetts Vital Records, 1841-1910, , Vol: 61 ; Page: 134. "Massachusetts Deaths, 1841-1915," database with images, FamilySearch (https://familysearch.org/ark:/61903/1:1:NWR2-H56 : 10 December 2014), Joshua Haynes, 16 Feb 1907; citing Natick,,Massachusetts, 72, State Archives, Boston; FHL microfilm 2,217,234. "Massachusetts, Births, 1841-1915," index and images, FamilySearch (https://familysearch.org/pal:/MM9.1.1/FXCZ-BKS : accessed 28 Nov 2012), Leda E. Haynes, 1853.